Once the players have bought their dog, they have to take full care; i.e. feed them, wash them, take them out for walks in the neighbourhood, play with them, ad cuddle them. Once the players have bought their dog, they have to take full care; i.e. feed them, wash them, take them out for walks in the neighborhood, play with them, ad cuddle them. 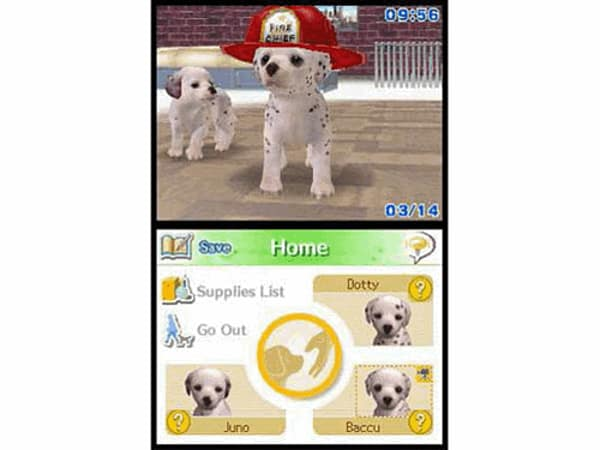 Through the built-in DS microphone, players can also each their dogs voice command-lead tricks – from the classic ’sit’ to the more advanced ‘backflip’. Once players have trained their puppy up, they can enroll their dog into competitions to prove their talent and earn prize money. There are three different type of competition: an obedience trial, a Frisbee-catching contest, and an obstacle course (against time). 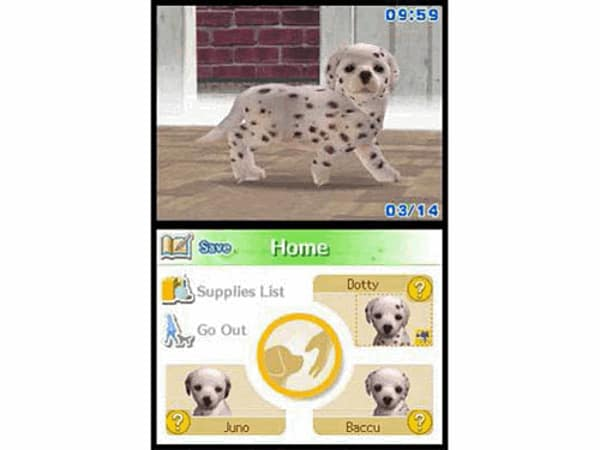 With the competition earnings, the player can buy food, toys, and accessories for their dog. It is possible to buy and own up to three puppies at any single time. Rooms in the Reform Shop from the beginning of the game; Northern European Style, Designer’s Mansion, Japanese-style Room. Over 100 items can be bought or found for the dogs to either play with them or dress them up. Overall probability of finding items remains the same apart from Santa’s Hat (Standard) and Japanese Collar (rare). Players need to collect over 20,000 Owner Points to make available; Jack Russell’s Book, Rhinestone Collar and Pearl Necklace.